BHG.com/CyberMonday: Win A $5K Shopping Spree! In celebration of this year’s Cyber Monday, happening on November 28th, BHG is running the Cyber Monday $5,000 Shopping Spree Sweepstakes. To enter, visit BHG.com/CyberMonday between November 15th and November 20th. One lucky grand prize winner will win a $5,000 shopping spree, awarded in the form of a $5,000 Overstock e-gift card. Hurry! You only have 5 days to enter this BHG Sweepstakes! 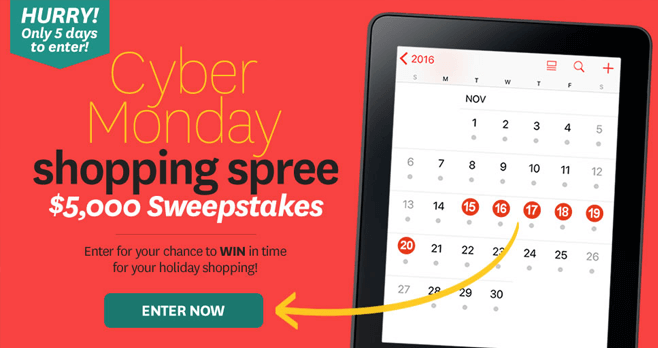 What Is The BHG Cyber Monday $5,000 Shopping Spree Sweepstakes? The BHG Cyber Monday $5,000 Shopping Spree Sweepstakes is a promotion sponsored by Meredith Corporation, 1716 Locust St., Des Moines, Iowa. It’s open to legal residents of the 50 United States and the District of Columbia, who are 21 years of age or older. The Sweepstakes Period begins at 12:01 a.m. CT on November 15, 2016 and ends at 11:59 p.m. CT on November 20, 2016. There is no limit to the number of entries each individual can receive throughout the Sweepstakes Period, however you may only use one email address to enter this Sweepstakes. On or about November 21, 2016, Sponsor will conduct a random drawing from among all eligible entries received throughout the Sweepstakes Period to select one potential winner. For the name of the winner, available after December 20, 2016, send a separate, self-addressed, stamped envelope to: Winner’s Name BHG Cyber Monday Shopping Sweepstakes, 1716 Locust St., LS 321, Des Moines, IA 50309. During the Sweepstakes Period, visit www.bhg.com/cybermonday and follow the instructions provided to submit a completed online entry form. Each entry form submitted will result in one entry. There is no cost to register or enter. Entering the Sweepstakes will automatically register entrant at www.bhg.com if entrant has not already registered. For complete details, including Official Rules, visit www.bhg.com/cybermonday.